Get that warm and fuzzy feeling with a bowl of Pancit Molo! 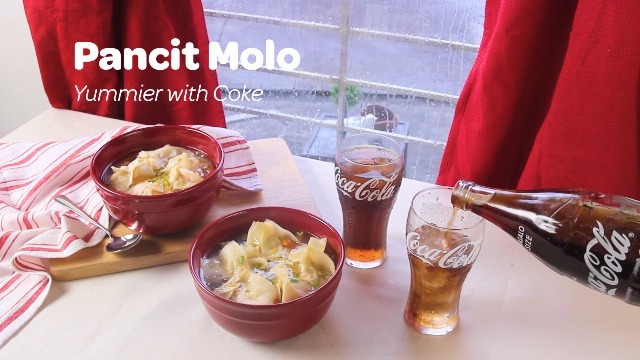 Rainy days are made complete with a delicious bowl of Pancit Molo and an ice-cold Coca-Cola. For the wonton: In a bowl, combine all ingredients and season with salt & pepper. Mix until well combined. Wrap in the molo wrapper. Set aside. In a pot, saute onion and garlic over medium heat. Once onion becomes translucent, add carrots and shredded chicken. Mix well. Pour the broth and let simmer for about 3-5 minutes. Season with fish sauce and pepper. Carefully add the wonton and let cook for 5-8 minutes. Serve with toasted garlic and spring onion.